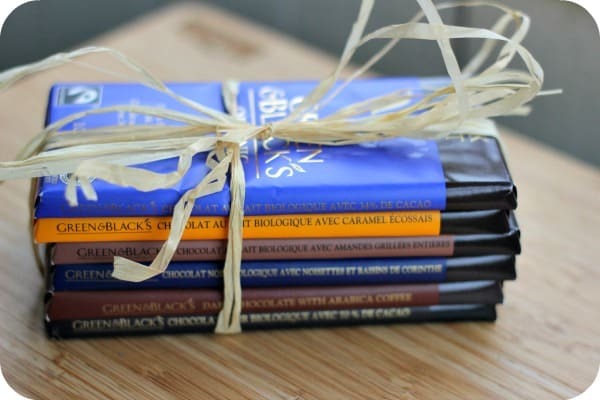 Green & Black’s makes delicious chocolate. I tried their chocolate bars about 2 years ago and fell in love with them back then. I don’t eat chocolate that often anymore, but when I do I crave a Green & Black’s chocolate bar. This is a company that focuses on quality taking every measure from “bean to bar” to ensure that the customers receives a top notch taste experience. They use organically grown Trinitario cocoa beans and spend more time conching (stirring constantly) to bring out the flavour they are known for. All Green & Black’s products are Fair Trade certified. This means that the company pays local farmers a fair wage and invests in their community to improve infrastructure, etc. 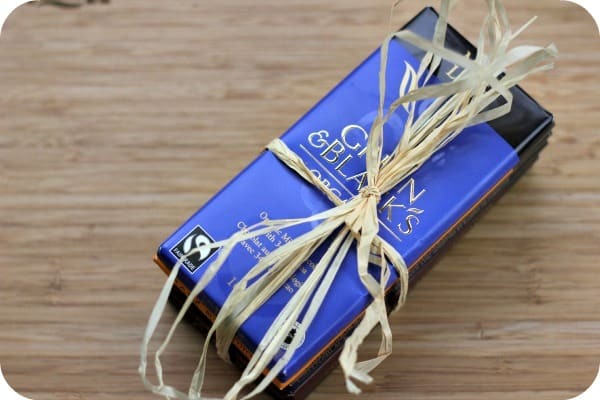 You can check out the Green & Black’s website to learn more about the origins of their chocolate, Fair Trade and more. 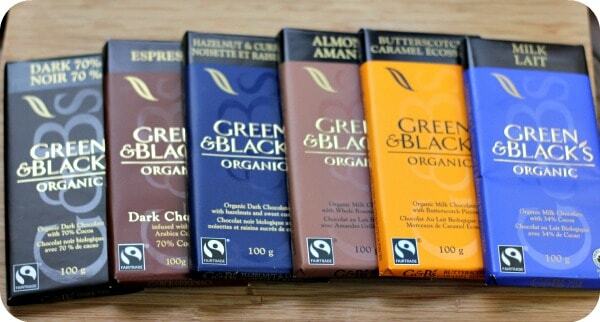 I was sent a tasty little package of delectable Green & Black’s chocolate bars to try out! They did not last long especially with John and his chocolate obssession. The man eats chocolate every day! My personal favourite is Butterscotch! It’s AMAZING!!!! It’s all gone now and I’ve been craving it since. Need to buy more asap…. John says the Milk Chocolate is #1. It’s good too, but I think the Butterscotch wins in my books! Find Green & Black’s chocolate at most grocery stores across Canada like Loblaw’s & Sobey’s, drug stores & health food stores across Canada. I’m going to pick up more to try a few recipes I found on Green & Black’s website. These Chocolate & Cherry Brownies are calling my name. Pick up some bars and wrap them in a festive bow to make a nice stocking stuffer for a chocolate lover on your list! Connect with Green & Black’s Canada on Facebook. The butterscotch caramel bar sounds delicious! I haven’t yet developed a palette for “good” chocolate …I am so used to nestle or Hershey that I consider that to Taste good. I will buy a Cadbury milk chocolate if I want an expensive bar @ $1.75 ! 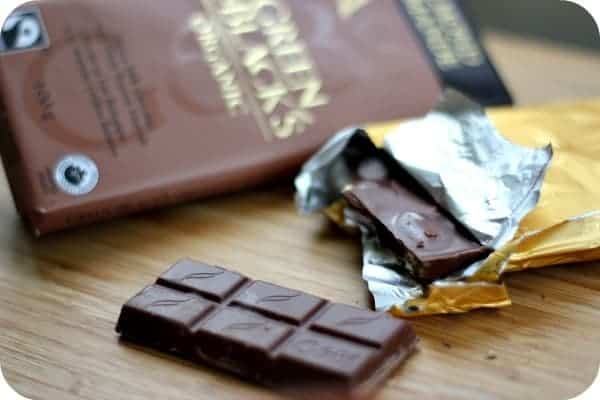 I have heard a lot about organic and fair trade chocolate and I really like that farmers re getting paid for,their work no the land…the process of getting to the cocoa bean and harvesting it to make chocolate is a process that many dont realize to be so laborious. I love Green and Black! Always been one of my faves. Chocolate and cherry brownie? I so need to try that! I’ve never tried organic chocolate. I really like the packaging – it looks so sleek. I’ve got to try one of these…or all of them! I love the Almond variety!! When it comes to dark chocolate, I cannot eat enough. I love dark chocolate when it is plain, with almonds, toffee, caramel, krispies, or etc. When I read that you do not eat chocolate anymore, I didn’t understand how?? O these sound so good! We love chocolate in our house and it goes fast! Would love to try these and the flavors are great! I want them all ;)! Thanks for sharing! I’ve only had the pleasure of trying green & black chocolates once at a friends house. My favorites were the dark chocolate and espresso. Absolutely the finest chocolate I’ve ever tasted. I would love to try the other flavors also and after reading your review I think I should treat myself to some. Thanks for bringing up some pleasant memories.